Here it is — a double layer chocolate coconut cake with coconut vanilla frosting. 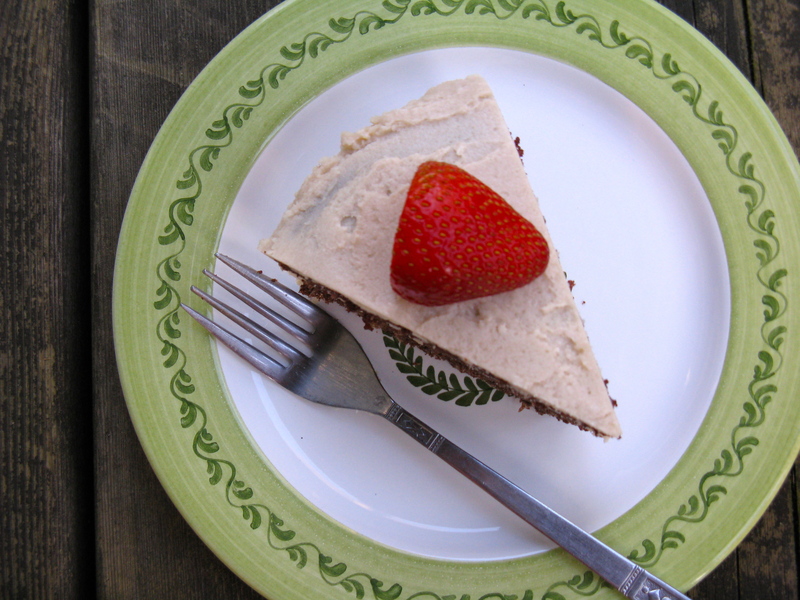 Naturally sweetened, gluten and grain-free, dairy-free, and totally delicious. It was my first time making a grain-free chocolate cake and I’m happy to say that it turned out quite well. Jesse really liked the chocolate coconut cake too, and topped it with the dark chocolate body paint he got from my mom and sister at my wedding shower! See mom, it’s not tucked away in the bathroom cupboard, like you urged not to do! The paint brush isn’t getting any use though, as Jesse uses a spoon for drizzling! I admit, it does look and smell like really delicious chocolate and it is quite dark. Jesse says it’s very good. 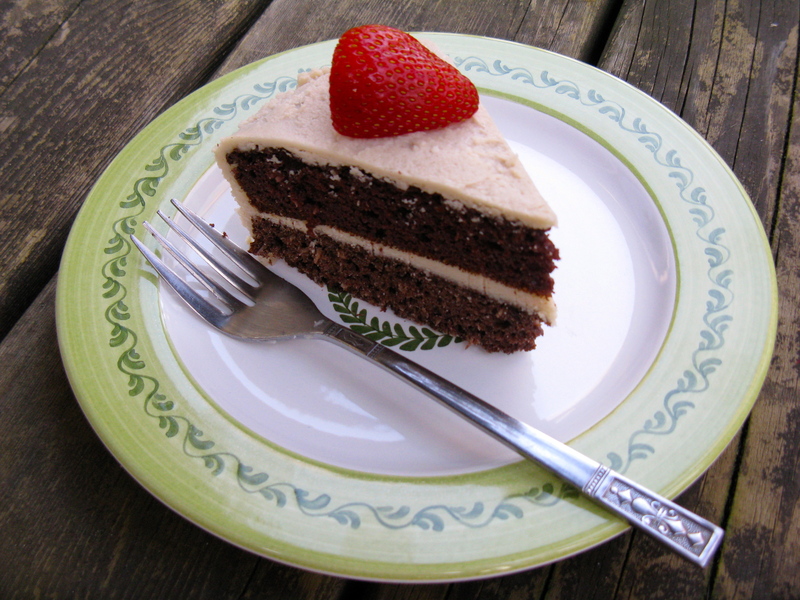 The cake was adapted from The Healthy Chef’s naked chocolate cake recipe and the frosting was adapted from The Detoxinista’s lemon coconut frosting. Measure out all the ingredients and toss into the blender. Make sure to measure out the coconut flour exactly. Also, this can not be done with a hand mixer or whisk. You need to use a blender and be very patient! Blend for 30-45 seconds or until everything is mixed together well. Pour into a bowl once done. The mixture will not be thick yet. Place in the refrigerator for at least 6 hours to set. I recommend letting it sit overnight. Before using, remove from refrigerator and mix well. Then, let the frosting soften to room temperature for a bit. This will make it much easier to spread. In a small bowl, combine coconut flour, cacao or cocoa powder, baking soda and sea salt. Set aside. In a kitchen mixer or large bowl, beat together eggs, melted oil, vanilla, honey and apple cider vinegar. If you don’t have a stand mixer, a hand mixer works just fine. Add dry ingredients to wet and blend. Once batter is blended and smooth, stir in shredded coconut by hand. Line two 9-inch cakes pans with parchment paper and grease the sides with coconut oil. Pour batter evenly into both pans. Bake for 20-25 minutes or until toothpick inserted in the center comes out clean. My cakes were done at about 24 minutes. Once done, remove from the oven to cool. Once cool, frost one of the cake tops with the frosting and stack the other cake on top. Then, frost the entire top and sides of the cake. Store any uneaten cake in the refrigerator. I had a feeling someone was going to say something about that! Haha! Thanks, it was really good! Not too sweet either, but just right. Yes, it’s moist. 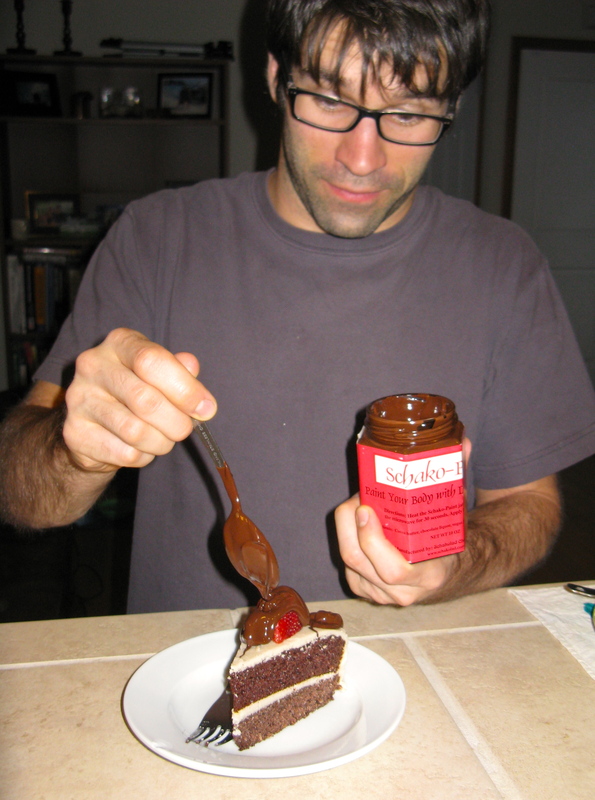 Maybe you will like it if you sometimes like chocolate cake. I buy cacao powder from one of our co-ops here in Portland, but you can also find it at Whole Foods or online. You can use a good quality cocoa powder too. where do you get your cacao powder from?